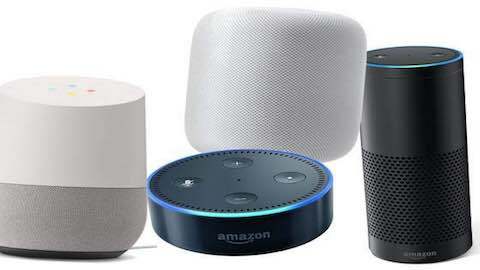 Smart speakers with built-in voice assistants are increasingly popular. Here's a look at where their used in the home and for what purpose. Marketed as a new hub for the smart home, Amazon Echo and Google Home have quickly established themselves at the heart of many American homes, the living room. 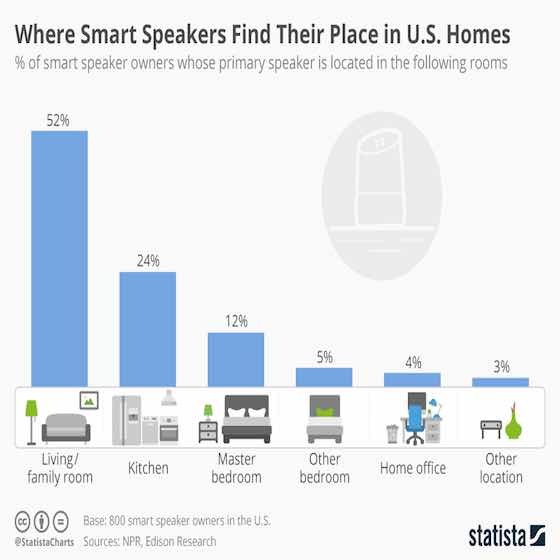 According to the Smart Audio Report published by NPR and Edison Research, more than half of smart speaker users in the U.S. place their devices in the living / family room. As the following chart illustrates, the kitchen is another popular place for Alexa and co. while bedrooms and home offices are less popular choices. What Are Smart Speakers Used For? 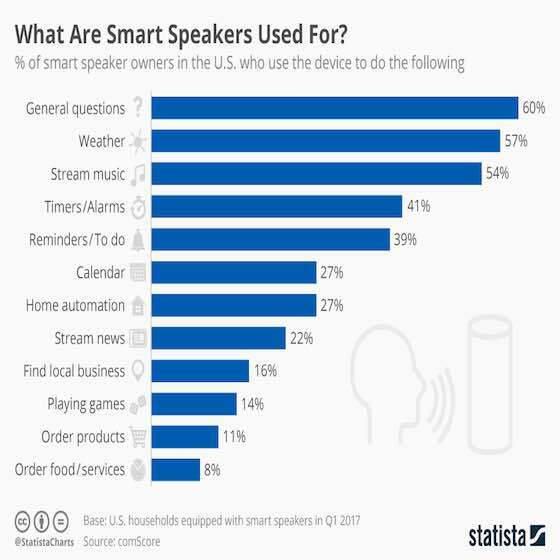 According to data from comScore very few users of smart speakers use them to order goods or services online. The most common use case is asking basic questions. In response to this (not surprising) reaction, Amazon repeatedly pointed out that the device only starts listening once the code word has woken it up and thankfully that appears to be true. The worst thing that could have happened to Amazon from a PR perspective at that time was for people to discover that the Echo listens in on its users without having been activated. It did not and the device became a runaway success. For Google, having recently extended its own line of smart speakers, that PR nightmare became reality this week, when a reviewer of the new Google Home Mini discovered that the device was recording conversations without having been prompted to do so. Google quickly issued a statement explaining that a faulty button had wrongfully activated the device and that this button would now be disabled on all devices via a software update. 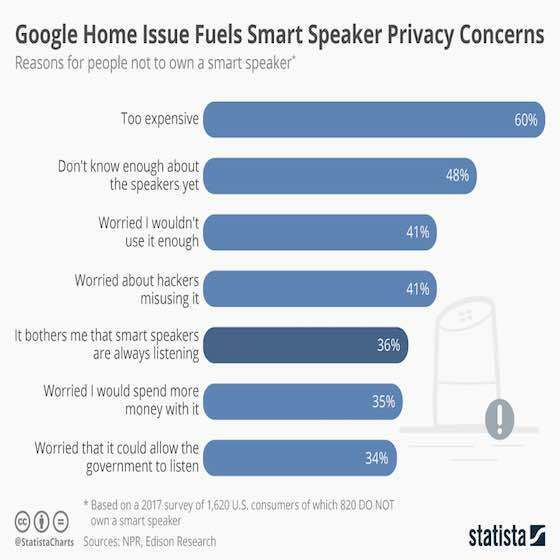 Despite the quick response, many people will see this episode as evidence that smart speakers shouldn't be trusted, because it confirms one of the most cited concerns with respect to smart speakers as our chart, based on NPR and Edison Research data, illustrates. This chart shows the most-cited reasons for people not to buy a smart speaker. Personal Tech & Gadgets "Smart Speakers Place in the Home"